First and foremost, if you are reading this article with genuine interest, then congratulations for having purchased an antique clock, or for deciding to do so. All you need now is the most exquisite and charming place in your house to put up the clock. The position of your new antique clock will also depend upon your clock’s style. To decide on any particular method, you first need to find out the type of your clock. The methods that can be used to put your antique clock on display are in a standing position, mounted on a wall, or simply mounted on any piece of furniture. Grandfather as well as Grandmother Clocks are those variety of antique clocks which are exhibited in a standing position. These clocks are free standing ones that may be put up in a corner or show cased in their own space. The most distinct feature of these clocks that solely makes up for their beauty is their case. Keep the clock as the main focus in the room and ensure that the clock is not surrounded by any other pieces of decoration or any form of clutter. This will enable the fantastic artwork of the clock to be displayed without any problems. If you wish to, you may even put up a spot light or a focus light on the clock for a better view. Focus in the form of a light is a wonderful way to display the fine details of your charming clock. If you have any antique wall clock that you wish to display, you will first need to decide exactly where do you plan to put it up. Decide only after keeping in mind the décor of every room and the area required to put up your vintage clock. There are quite a few wall clocks that are of a decent weight. So be cautious not to place them anywhere where they might dominate the place. Another way to help you decide is to look up for the manufacturing label of your wall clock in a catalogue. These catalogues often inform where the wall clock was designated to be kept when it was an heirloom. These books are however, to merely aid you in this process of decision-making. You may or may not stick to the intention if the original owner. The final position is definitely in your hands. Antique clocks that are displayed on any furniture will be mantle clocks such as anniversary clocks or an assorted piece of small timepieces. These can be very well decorated on bookshelves, wall shelves, entertainment centers, mantles, dressers, or even coffee tables. You may even buy wooden or metallic stands for your antique clock. You may choose from a variety of stands of many varied colors and designs. If there are kids in the house, select a spot that it unreachable to them to avoid any sorts of mishaps. 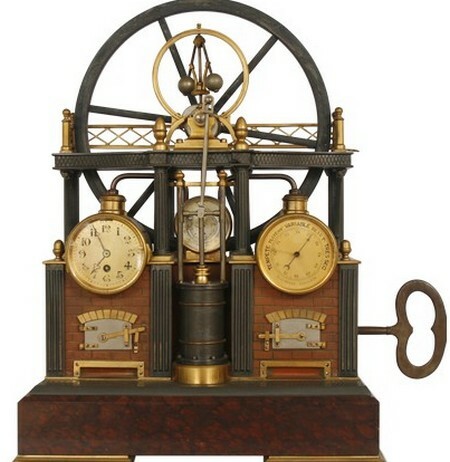 A curio is also a very innovative way to display and protect the antique clock. If you choose a curio, it will also enable you to keep future prospects open to add onto your existing collection of antique clock(s).